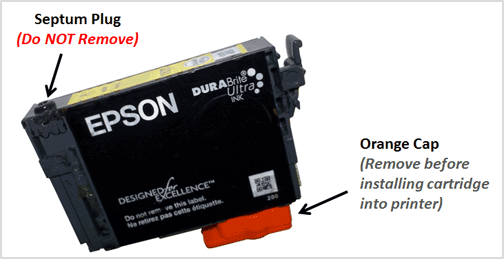 NOTE: Epson 252-I (initial or introductory version cartridges) are not supported for refilling. The chips on these cartridges cannot be reliably reset and ‘unrecognized cartridge’ alerts may result, therefore we do not refill 252-I cartridges. However, the majority of in-store retail ink refill labs will refill Epson 252 regular and 252XL (high capacity) cartridges for refilling. NOTE: When empty, refilled Epson T252 & 252XL cartridges will display “Ink cartridges cannot be recognized” or “Cannot Recognize The Following Cartridges….Try Installing Them Again” alert messages (…only occurs when the cartridge is empty – this is COMPLETELY NORMAL behavior for refilled T252 ink cartridges which are completely out of ink). Return cartridge for refilling when this occurs. See video below for more information. 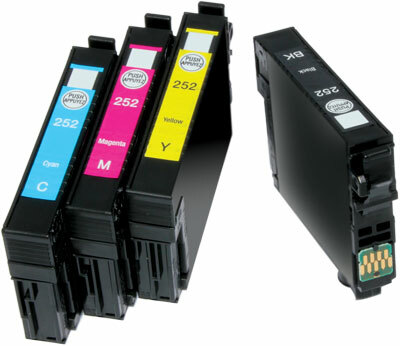 Epson T252 & T252XL (high capacity) ink cartridges support Epson WorkForce WF-3620, Epson WorkForce WF-3640, Epson WorkForce WF-7610, Epson WorkForce WF-7620 & Epson Workforce WP-7110 printers.